I love the smell of bread baking in the oven. 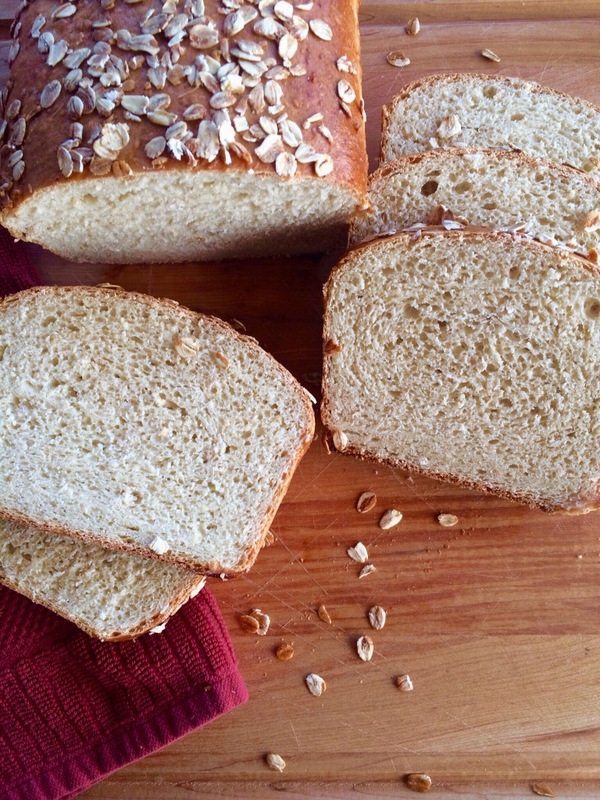 There is no better way to make your house more inviting than the smell of freshly baked bread. For my second recipe of “A Strawberry Summer,” I wanted to do something with the Strawberry Jam. 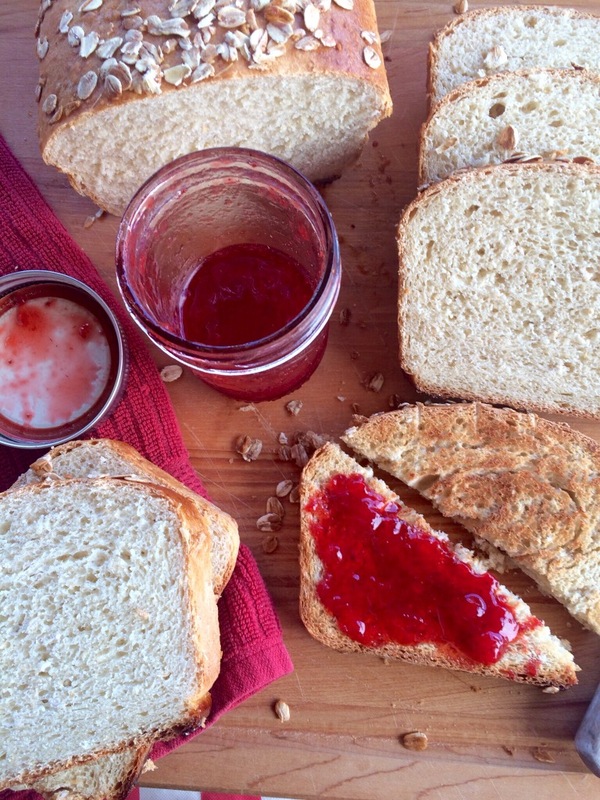 What goes better with homemade strawberry jam than….homemade bread? 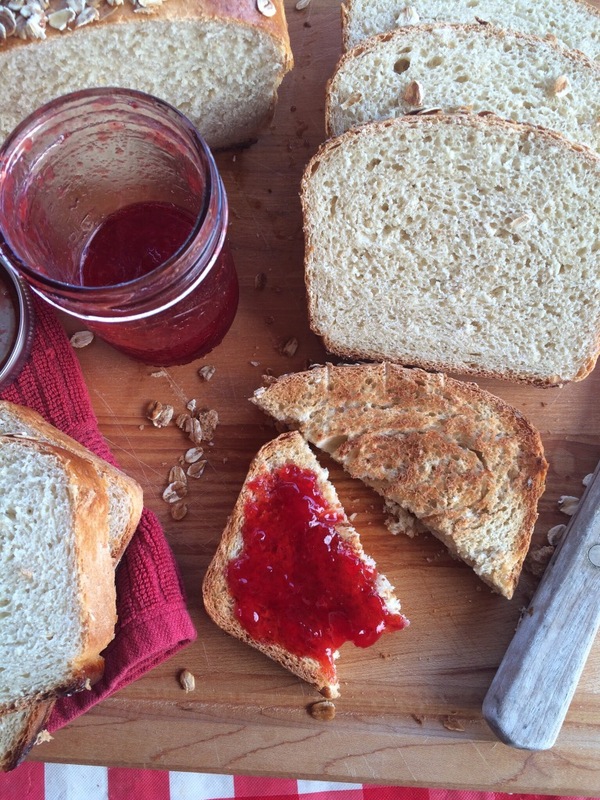 I love to toast a slice of this bread and spread it with a generous amount of strawberry jam, add a cup of hot coffee or a good cup of tea…it’s the perfect breakfast. If you’re new to bread baking it’s really simple. Temperature is very important when baking bread! Temperature and yeast: When proofing yeast, the liquid can’t be too hot or it will kill the yeast. If the liquid is not hot enough, it won’t activate the yeast. 110-118 degrees F is the perfect temperature for your yeast. I’ve found that anything over 120 degrees F is too hot and will kill it, so keep your liquid temperature in between 110-118 degrees F.
Temperature and rising: When you’re rising the dough, place it somewhere warm and free of draft. I like to place my dough on top of the dryer in the laundry room with the door closed. The dryer, when on, and the door closed, keeps the room warm. Again, if it’s not warm enough—-it won’t rise. Temperature and bread: To ensure that your bread is done and baked completely, use a thermometer inserted at the bottom of the loaf, to check the internal temperature. Bread is done at 190 degrees F.
In the bowl of a stand mixer, combine flour, oats, yeast, and salt. In a two cup measuring cup, heat milk and butter in microwave until butter melts. Add in water and honey, mixture should be between 110-118 degrees F.
Make a well in flour mixture and add liquid, mix with dough hook. Knead in mixer for 10 minutes. If dough is wet add flour one tablespoon at a time, until dough is smooth and elastic. Place dough in a lightly oiled bowl, cover and allow to rise until doubled in size. This may take 1/2-1 hour. Once the dough has risen, place dough on a clean surface. If dough is sticking lightly flour the surface. Flatten out the dough and then roll it up tucking the ends under, forming a loaf. Place the shaped dough into a greased loaf pan, cover and let rise for about 1/2 hour or until doubled in size. Brush top of risen dough with 2 Tablespoons of warmed honey and lightly sprinkle with 1 Tablespoon of oats. Bake for 45 minutes, until the bread is a deep golden brown. Remove bread from pan and check the internal temperature. If bread is not 190 degrees F, return back to pan and bake an additional 5 minutes. Once bread is done, transfer to a cooling rack and cool for about 30 minutes before slicing. Slice and serve with strawberry jam.